The banner o the Republic o Maldives is reid wi a lairge green rectangle in the centre bearin a vertical white crescent; the closed side o the crescent is on the hoist side o the banner. It wis adoptit on Julie 25, 1965. The reid rectangle represents the boldness o the naition's heroes, an thair willinness tae sacrifice thair ivery drop o bluid in defence o thair kintra. The green rectangle in the centre seembolizes peace an prosperity. The white crescent moon seembolizes a state o unified Islamic faith. The earliest banner o the Maldives consistit o a plain reid field. Later, a black an white striped hoist cawed the Dhandimathi (Dhivehi: ދަނޑިމަތި) wis addit tae the banner. This version o the banner wis uised till early in the 20t century, when Abdul Majeed Didi addit a crescent tae the naitional banner. At the same time, a distinct state banner wis made, which haed the crescent on a green rectangle. Thir chynges wur made some time atween 1926 an 1932, durin Abdul Majeed's term as Prime Meenister. 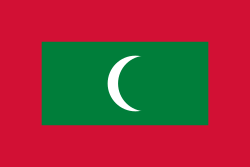 In 1953, the Maldives became a republic, resultin in anither banner chynge. The naitional banner wis dropped an the crescent on the state banner wis reversed, sae that it faced the hoist. The Sultanate wis restored in 1954, but the banner wis no chynged back. Instead, Muhammad Fareed Didi creatit a new banner specifically for the Sultan, wi a five-pointit starn next tae the crescent. A version o this banner is still uised the day as the Presidential Staundart. When the Maldives gained unthirldom in 1965, the black an white hoist wis removed, givin the banner its modren form. Earliest banner o the Maldives, athoot the striped hoist. Banner uised till the early 20t century. Sultan's Ensign frae 1965 tae 1968 an Presidential Standard syne 1968. Banner uised bi the breakaway Suvadive Republic o the soothren atolls (1959 tae 1963). Construction sheet o the modren banner. Wikimedia Commons haes media relatit tae Flags of Maldives. This page wis last eeditit on 2 September 2018, at 00:41.